…it makes you wonder which Biblical principles they are referencing. You would think they would produce their goods in a state or country with the strictest adherence to “Biblical Principles.” This is far from the case. Most of their merchandise is imported from China: where female infanticide and forced abortion is the highest in the world. China truly is the most egregious abuser of this form of population control. It’s true, millions of companies import goods from China and other nations who impose slave labor on their inhabitants. 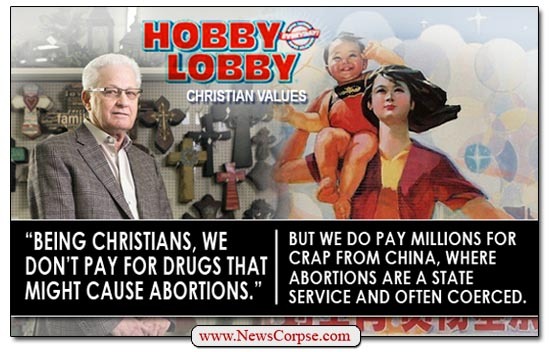 But this is Hobby Lobby, a company founded on Old Testament values. Values like those found in the Book of Numbers, 5: 11-13, where “God” gives instructions on how to make an unfaithful wife have an abortion. China, a Communist nation, has little regard for any “religious values,” and this doesn’t seem to concern the folks at certain privately held corporations, which are far more numerous than you can imagine. Never did the founding fathers intend for a religious book, written by Bronze Age desert-dwellers to determine corporate policy which affects the most marginalized workers in this free country. Ironically, their 401K retirement fund includes companies that produce ‘unacceptable’ forms of contraception. Once it was part of the dreaded liberal plot (invented by conservatives) with the ACA, it all of a sudden became contentious. Yet the issue of abortion truly can’t be that important if they tacitly support China’s government. The Bible may, indeed does, contain a warrant for trafficking in humans, for ethnic cleansing, for slavery, for bride-price, and for indiscriminate massacre, but we are not bound by any of it because it was put together by crude, uncultured human mammals.